Space games in general and space shooters in particular are a feast for your eyes and fingers. In their predominant majority, space games look vibrant, colorful – a neon-induced spectacle. We have decided to review a pure space shoot-em-up, a game that encompasses shump elements with strategy, thus adding a great deal of micro-management and variety in terms of gameplay. Without much ado, here is our today’s pick for an arcade game - Space Galaxy Attack. What is Space Galaxy Attack? 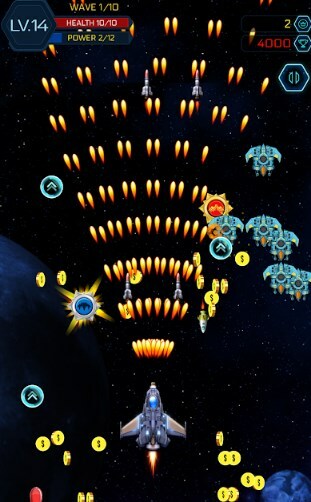 Space Galaxy Attack is a cool arcade that combines shooting and space strategy into one perfect and fun-to-play game. Enjoy an intense story, HD space graphics, smooth controls, addictive and endless gameplay anywhere and anytime – the game is free for download, great for all ages and works on all devices that support Android 4.3 and up. The gameplay of Space Galaxy Attack is pretty simple, yet extremely challenging. Basically, you’re a space shooter who is on a mission to save the Planet from the evil aliens. Your main objective is to use all of your forces to shoot them down and be the hero that the universe needs. Use your fingers to move your cool spaceship around stars and planets, aim precisely and kill as many enemies as possible. Space Galaxy Attack offers hundreds of challenging levels, all created with different difficulties. So you will start off with simpler missions, but progress to face more difficult ones. In addition, you can collect and use awesome power-ups and boosters while playing and let them increase your shooting powers. You will be able to track your scores on a global leaderboard and complete with other players from all around the world. Get to the forefront of endless battles with space intruders, enjoy hours of fun by downloading the Space Galaxy Attack game – it’s absolutely free on the Google Play Store.